You want transparency and we want to give you the facts. We, your fellow nurses on the WSNA negotiating team, will be holding sessions to provide information and work to answer the outstanding questions. Following the “NO” vote, we heard from RNs around the hospital. In response, this meeting is designed to hear and respond to your questions and concerns about the previously negotiated proposal and talk about next steps. We are in the process of scheduling another bargaining session with the federal mediator. EVERY RN needs to come and continue the conversation. You must be part of the dialogue and solution. We need your help to move forward in the process of securing the best contract possible for everyone. 8-9:15 a.m. / 4-5:15 p.m. / 5:30-6:45 p.m. / 8-9:15 p.m.
6-7:15 a.m. / 1:30-2:45 p.m. / 5:30-6:45 p.m. In attendance to work with us, will be members of our negotiation team, WSNA Attorney and Chief Spokesperson Lane Toensmeier, WSNA Resource Nurse Representative Hanna Welander, WSNA Chief General Counsel Timothy Sears and Director of Strategic Initiatives Anne Tan Piazza. For questions or concerns, please contact Resource Nurse Representative Hanna Welander at 206-575-7979, ext. 3035 or hwelander@wsna.org. Last week's results are in, and the overall majority voted NOT to ratify the proposed contract. Now we move forward. We need to know more about what we each value. Together we can pave a path to success. "Nurses United, We'll Never Be Divided." We are listening. Please fill out this new survey in order for us to address your concerns both within and outside the negotiations table to improve the working conditions and patient safety at SJMC. As your negotiation team we worked hard on your behalf. The negotiation team is committed to redouble efforts to achieve an agreement ALL nurses support. Now we need to hear from you. Give us your input, tell us your thoughts and concerns about the contract being rejected. Watch for notice of a survey on Monday, April 15. Please complete it ASAP and tell your coworkers to do the same. We are strong, we are many, and we should not have to be fighting this hard for a fair contract. But we will! Questions? Contact WSNA Nurse Rep. Pat McClure at (360) 904-8004 or pmcclure@wsna.org. 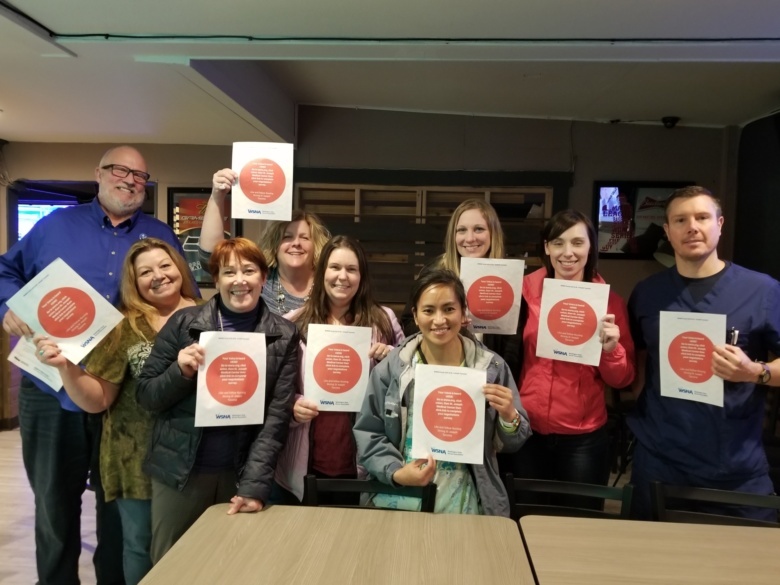 WSNA members at St. Joe's - Tacoma have voted to reject the Tentative Agreement. The contract will not go into effect. Our negotiation team will meet soon to discuss next steps. Questions? please contact WSNA Nurse Rep. Pat McClure at (360) 904-8004 or pmcclure@wsna.org. Nurses Week celebration – a fun free opportunity! 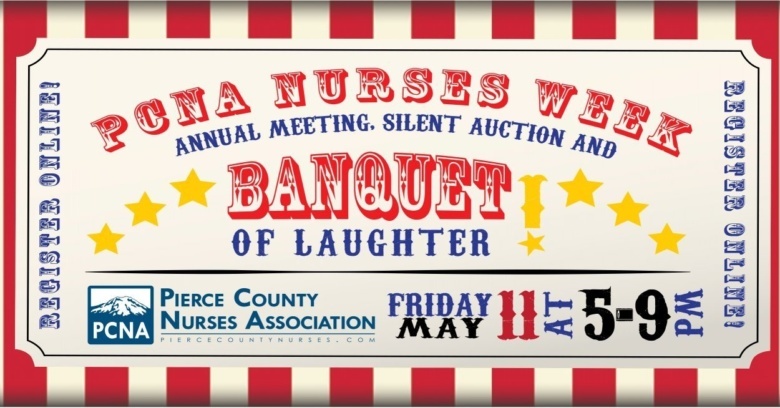 Your WSNA officers are sponsoring attendance to the Pierce County Nurses Association annual banquet. If you would like to attend, please email Rachael DeSouza desouza.rachael@gmail.com to be added to the list. Please RSVP with Rachael no later than Friday, May 3, 2019. You are welcome to bring a spouse, friend, etc., however, your guests must register and pay separately. 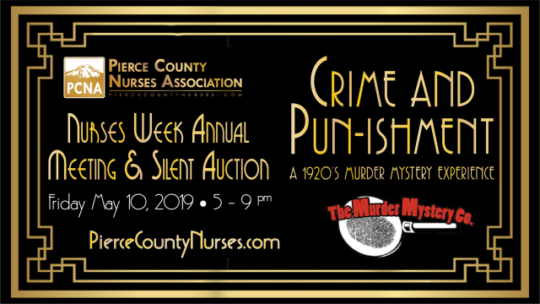 For more information about the event, visit the Pierce County Nurses website. Complaints can be filed in any format including the electronic Staffing Complaint/ADO forms (wsna.org/union/ado). Commitment from the Medical Center to address issues including proper signage and the assignment of security personnel. WSNA will be able to appoint 5 RNs to the Safety Committee to oversee the Workplace Violence Prevention Plan. The support we received from members, including the successful picket, has paid off. We are happy to announce that we have reached a Tentative Agreement on a contract! Your bargaining team recommends this contract for ratification. All nurses with a 0.9 FTE and up will receive a ratification bonus of $700. Nurses below a 0.9 will receive a prorated portion of $700 (i.e. a 0.5 FTE will receive $350). Supplemental Part-Time and Per Diem nurses will be treated as 0.2 FTE ($140). 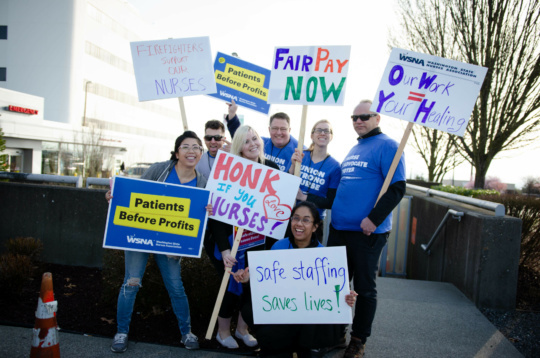 Your bargaining team successfully fought off the Medical Center’s attempt to reduce the premium paid to Supplemental Part-Time nurses from 15% to 10%. The Medical Center has informed us that they will exercise their right to stop hiring into this position. In the future, they will utilize the Per Diem position. However, nurses currently employed as Supplemental Part-Time Nurses will continue under the same terms and at 15%. The new contract will require an increased work commitment from Per Diem Nurses. Per Diems will now have to make themselves available for 4 shifts per month which will include either one full weekend of 2 shifts or 3 weekend shifts. Per Diems will also need to make themselves available to work 2 holidays during the year. As compensation, Per Diems will now be placed on the wage scale plus an additional 10%. Depending on a nurse’s years of experience, this will result in substantially more money for some Per Diems. Staffing was a top priority for the bargaining team. In addition to wage increases that should help the Medical Center recruit and retain quality nurses, the new contract establishes a clear method for nurses to both proactively provide feedback into staffing plans and file complaints regarding staffing practices with the Staffing Committee. Complaints can be filed in any format including the electronic ADO forms on the WSNA website (wsna.org/union/ado). Staffing complaints are a very important tool for stopping some of the unsafe staffing practices that are currently in place. Remember: Both our contract and state law prohibit the employer from retaliating against you for filing a complaint. Work should not hurt! The new contract includes a commitment from the Medical Center to utilize the Workplace Violence Prevention Plan to address measures such as proper signage and the assignment of security personnel. In addition, WSNA will be able to appoint 5 RNs to the Safety Committee to oversee the Plan. We need to keep working to make our workplace safe for our patients and for us. The problem of inaccurate and indecipherable paychecks remains an ongoing concern. It is also a difficult problem to solve during union contract negotiations. The new contract does require the CHI Division Director of HR Operations to meet with 3 nurses appointed by WSNA during the next 12 months. The bargaining team is hopeful that raising the issue with somebody outside of St. Joes will shine a spotlight on this problem so that solutions can be implemented. In the meantime, nurses will now have 45 days to notify the employer of errors on paychecks. The Clinical Groupings in Article 7.6.1 has been updated. Unfortunately, we were unsuccessful in removing the Walters group from the Main OR/PACU. 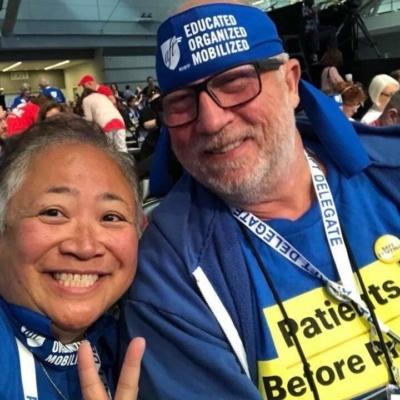 While the Medical Center committed to slowing down the integration of the groups, they refused to recognize the concerns of the nurses who are impacted by inadequate training and unfair scheduling. The grievance procedure will have a simplified timeline. In addition, WSNA will now be able to file “Association Grievances” in cases where more than one nurse has been affected. The Medical Center has committed to a policy of ensuring adequate designated space for lactating mothers. Pursuant to this policy, a new room will be made available in the near future. The new contract contains language to protect us if CHI sells the facility or merges with another entity during the term of the contract. Please note the new calendar for requesting time off. Beginning in 2020, nurses need to submit their requests between January 1 and March 1 for the vacation year running from May 15 through May 14. Also, nurses will no longer have to utilize accrued PTO time if you have worked your FTE for the week. The bargaining team believes this will give nurses an incentive to pick up additional shifts when they are available to do so. 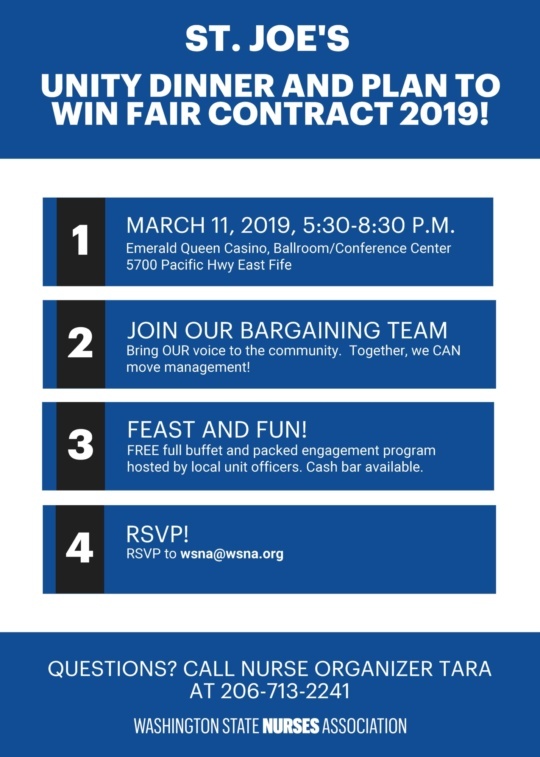 The VOTE to ratify this contract will occur on April 11 from 6:15 – 9 a.m., 2:15 – 4:15 p.m. and 6:15 – 8:30 p.m. in the Dietary Conference Room. 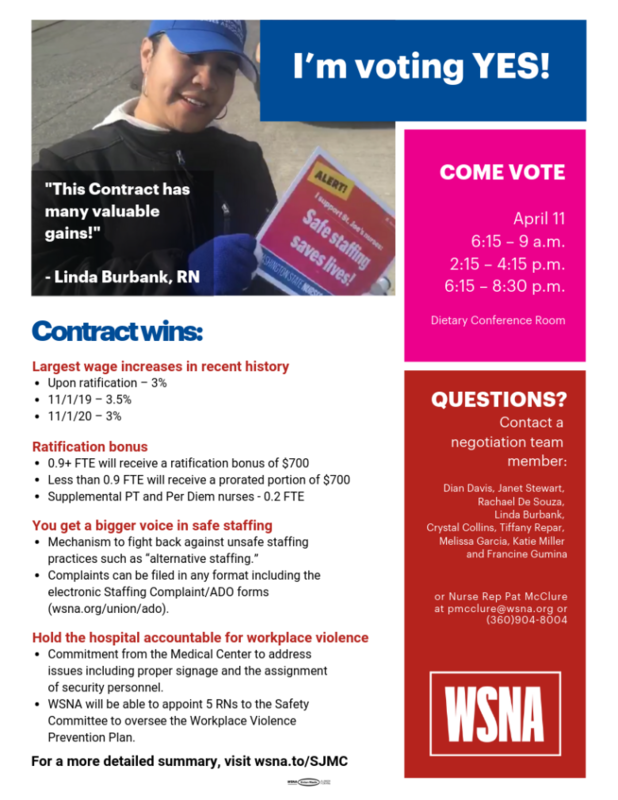 You must be a WSNA Member in good standing to vote on the contract. YOU ARE WSNA!! Pat McClure, WSNA Nurse Representative at 206-575-7979, ext. 3110 or pmcclure@wsna.org. 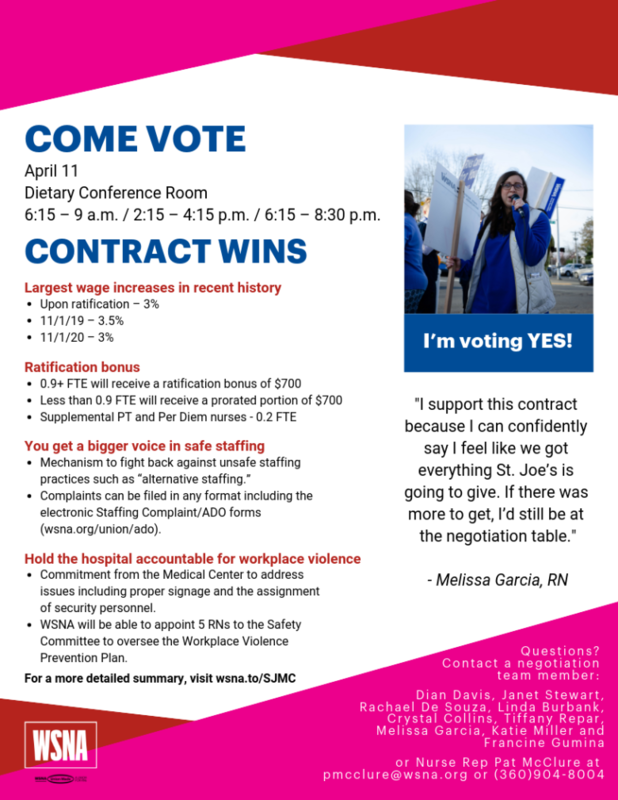 We have a tentative agreement to vote on April 11, in the Dietary Conference Room. The times are such that we believe it gives everyone a chance to come down to cast your vote. The TA comes with a recommendation for a “YES” vote. The times are 6:15 – 9 a.m.; 2:15 – 4:15 p.m.; and 6:15 – 8:30 p.m.
Our Chief spokesperson will be present to answer any questions that you have regarding the contract. We look forward to seeing you on April 11 in the Dietary Conference Room. 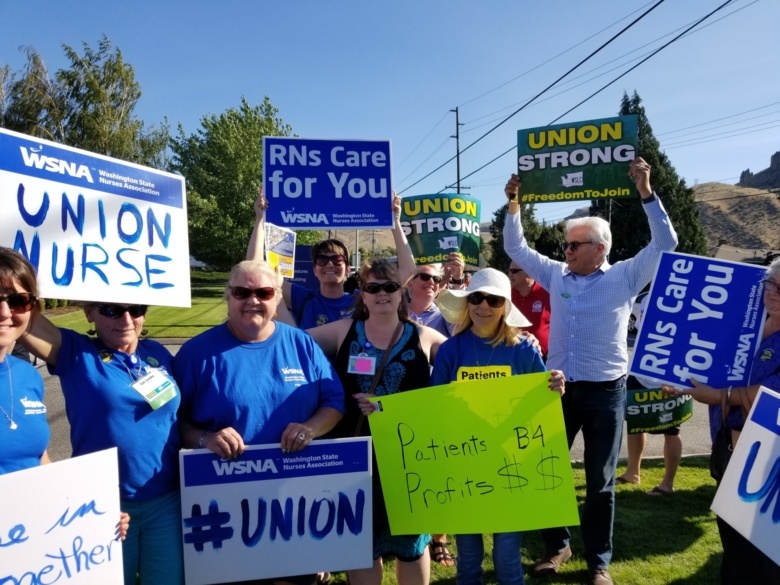 If you have questions, please do not hesitate to call WSNA Nurse Rep. Pat McClure at (360) 904-8004 or one of the negotiating team members; Dian Davis, Janet Stewart, Linda Burbank, Crystal Collins, Rachael DeSouza, Melissa Garcia, Katie Miller, Francine Gumina or Tiffany Repar. We've reached a Tentative Agreement! After 13 negotiation days and more than six months, we have reached a tentative agreement with hospital management! Look what our unity, solidarity and involvement have accomplished! We, your RN negotiation team, want to thank everyone who showed support during these contract negotiations. Thursday, April 11 is the voting day! Location to be determined. A negotiation summary will be coming soon, however, we want you to know that we recommend this contract. Again, thank you! Your team could not have reached this tentative agreement without all of your support. More details to come – stay tuned! Our picket is THIS Thursday, March 21! Let's get the administration to do the right thing. It's time to use our collective bargaining voice to fight for what we deserve. Members Rachael De Souza, Tony McClusky and Sally Budack with their signs and banners from Friday, March 15! We'd also like to give a huge shout out to our neighborhood supporter, Hilel, for the support banner outside of his house near SJMC. After months of negotiations, we are again at a moment when our collective voice becomes even more important to encourage the administration to do the right thing. Nurses showed up in big numbers to our unity dinner and now it's time to get ready for our picket. Safe staffing allows nurses to safely take care of patients. St. Joe’s administration needs to commit to ensuring safe staffing in every part of the hospital that allows nurses to take breaks and provide quality patient care. We should not have to risk their personal safety just to do our jobs of giving patients the very best care. Nurses at St. Joe’s need protections in our contract to keep ourselves and our patients safe. 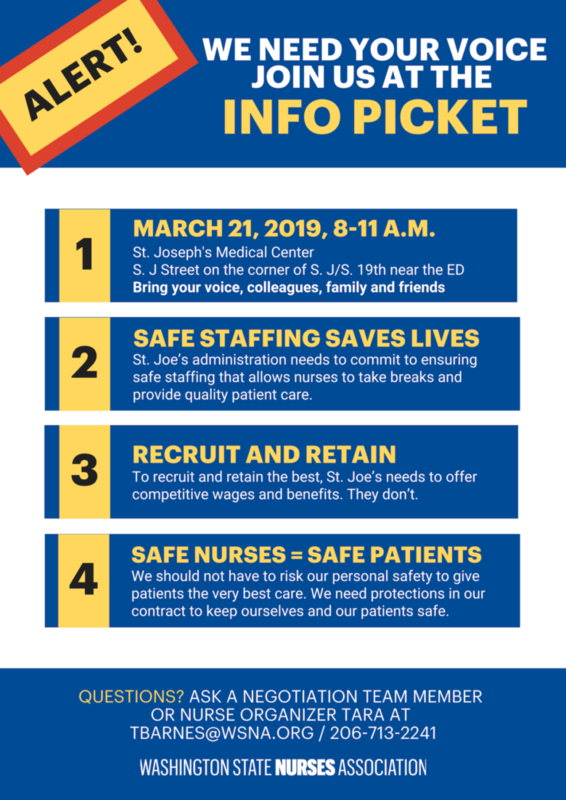 Show up to show your support for our team and the issues that mean the most to nurses and patients at St. Joe's. Follow us on Facebook and make sure you get your car sign to show your support every day! Questions? Ask a negotiation team member or Nurse Organizer Tara Barnes at tbarnes@wsna.org / 206-713-2241. You have until the end of Feb. 28, 2019, to submit seniority-based vacation requests through May 14, 2020. This is a change from the current contract language. We wrapped up our 12th negotiation session, the second with the federal mediator, and have yet to come to a mutual agreement about the contract. The workplace violence proposal offered by management is inadequate to deal with the safety issues we nurses face on a daily basis. WSNA’s workplace violence proposal requires a plan of action be implemented and protection for staff when assaults occur. Management continues to reject this proposal which would implement real change and actually improve the safety in our units. Management has stated the new Washington state staffing law covers any and all staffing issues, and that WSNA should not be able to file grievances based on staffing. WSNA strongly disagrees with this position. WSNA has proposed standards of staffing to ensure nurses get breaks, can use their PTO and for management to adhere to their own staffing plan. WSNA strongly believes management is using KRONOS to underpay staff. We continue to ask to meet with those who can address the issues we have brought forth. They continue to insist we meet with management members who have proven to be inadequate in fixing the system over the last twelve years. SJMC also continues to insist on a 5% pay cut for Supplemental Part Time staff. The employer states retroactive pay back to Nov. 1, 2018, is out of the question. Your WSNA negotiation team has worked hard to improve contract language to make SJMC a safer place to work. Filling staffing vacancies and improving retention and recruitment is directly related to wages and premiums. Management’s wage package is not market competitive. WSNA continues to propose annual raises and a BSN/MSN premium pay that will make SJMC competitive with the market, while both retaining and attracting quality nurses. Your bargaining team has spent hundreds of hours at the bargaining table. What are the next steps? Show up at the Unity Dinner - March 11 from 5:30 - 8:30 p.m. Questions? Contact a negotiation team member or WSNA Nurse Representative Pat McClure at pmcclure@wsna.org or at 360-904-8004. Join us March 11 for a Unity Dinner! Join us March 11 at the Emerald Queen Casino. 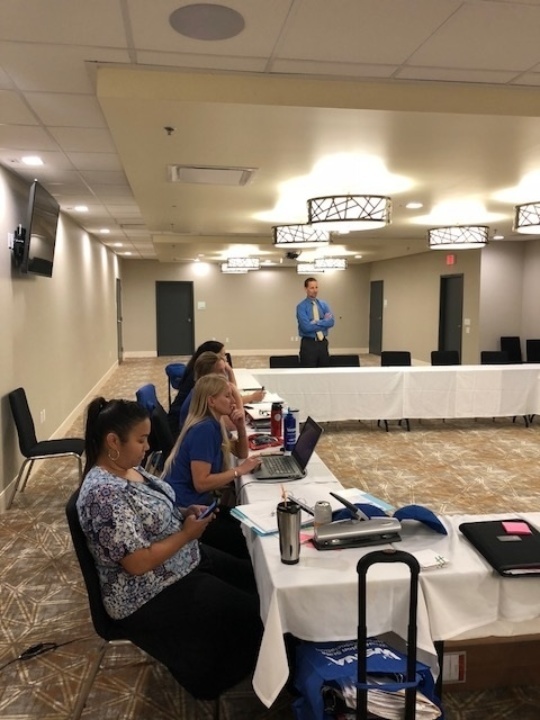 We want to thank the Walters PACU nurses who took the time to come to negotiations to share their testimonials on how unsafe it is for them to be required to float to the Main OR, without adequate training or orientation. We were hoping to see more movement from management toward getting an agreement. This did not happen. Our next negotiation date on Feb. 1 will be with a mediator. Questions? Contact a negotiation team member or WSNA Nurse Rep Pat McClure at pmcclure@wsna.org. We want to thank the SDS nurses for their very compelling testimony of what it is like to be required to float to the Main OR without the adequate amount of training or orientation. Also, thanks to the nurses who took the time to write their testimonies that were read by the Team. Otherwise, it was a disappointing day. After WSNA made considerable movement during the last session, it was thought that management would respond in kind. Unfortunately, that did not happen. We will meet on February 1 with a mediator and management. Stay tuned for the next steps. Be sure to wear your blue shirts and be ready for more action. Questions? Contact Pat McClure - pmcclure@wsna.org or (206) 575-7979, ext. 3110. Now is the time to let management know just how concerned you are for your patients and your nursing license. The Safe Staffing Survey is open Jan. 14 - Feb. 15. This is your opportunity to let management know just how short the staffing actually is. When you start to dread going to work, you know things are bad. This shortage of nurses impacts the care you are able to give each of your patients. Short staffing increases the likelihood of making a mistake, impacting your nursing license. 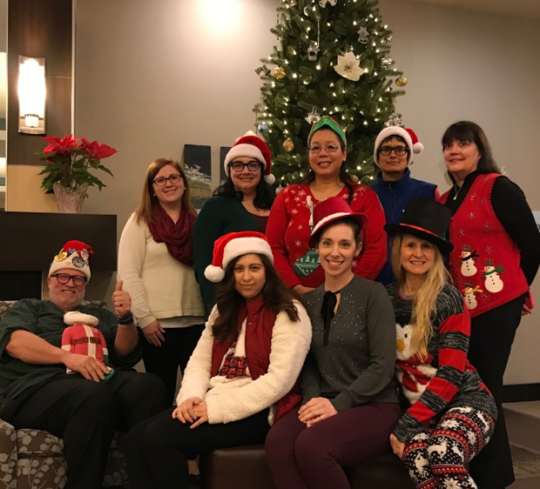 Your WSNA officers and staffing committee are encouraging each and every one of you to take the time to share your honest, professional opinion of what is happening at the hospital. How it is impacting the care you are able to give each of your patients? The nurses sitting on the staffing committee are committed to working with management to get a true picture of what is going on. In order to do that, we need you to take the time to let your opinion be known. Please help us get the best results possible, fill out the survey and give us your honest opinion of how things are going with staffing. Questions? Contact any WSNA officer or WSNA Nurse Representative Pat McClure at pmcclure@wsna.org or at (360)263-4258. I'm Rachael De Souza, our WSNA membership officer at SJMC. I work as a nurse on the 7th floor. Many nurses are hearing about changes planned for the ED Obs/MSOA, ACC, South Pavilion and 8B/C, which could impact our work experiences. Times: 7:30-9 a.m. and 6-9 p.m.
Pat McClure, our WSNA nurse rep, will also be there. If you can’t make it, please share your thoughts via personal e-mail. We want everyone to have a voice. Please invite your coworkers. We'll send them an email and give them a call, but the best invitation is in person from someone they know (like you)! If you are not in one of these units, please pass on the information to folks you may know in those units. You are always welcome to call, text or email me. A big thanks to the 7th floor for sponsoring food for us during our 10-hour session. 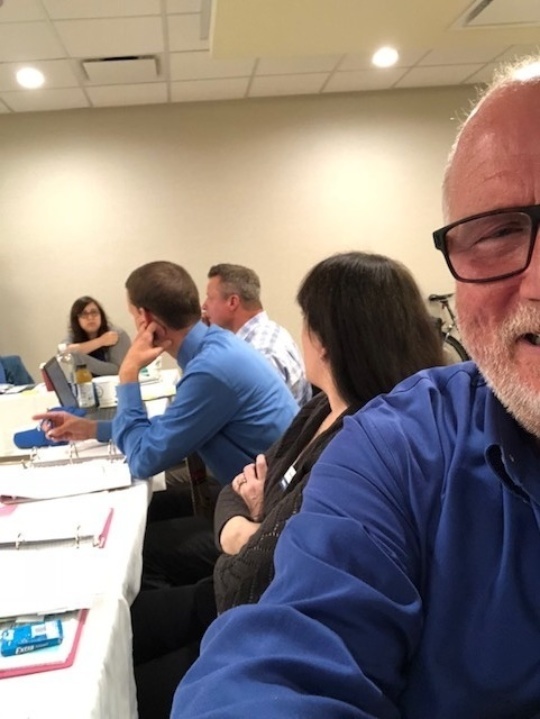 WSNA attempted to make significant movement towards an overall agreement but we were met with resistance from management, who did not reciprocate. We are disappointed with their response to our proposals and their lack of movement. The employer gave us a new economic proposal with wage increases of 2.5%, 2.75% and 2.5%. We believe that this is far below what would adequately meet the recruitment and retention needs of the hospital. They have withdrawn their proposal to decrease the 15 percent pay in lieu of benefits. But, in what feels like a slap in the face, they maintain their proposal to decrease pay for supplemental part-time nurses. They have failed to make substantive proposals to address the critical issues of workplace violence language and nurse staffing. They continue to reject our proposals on nursing degree premiums and float premiums, which we believe would also help with recruitment and retention. They also continue to reject our proposal to separate Walters from the main OR in clinical groupings, despite a showing of overwhelming support from nurses of Walters. Where we are now: Both parties have agreed to begin to use a federal mediator to help us reach an agreement. 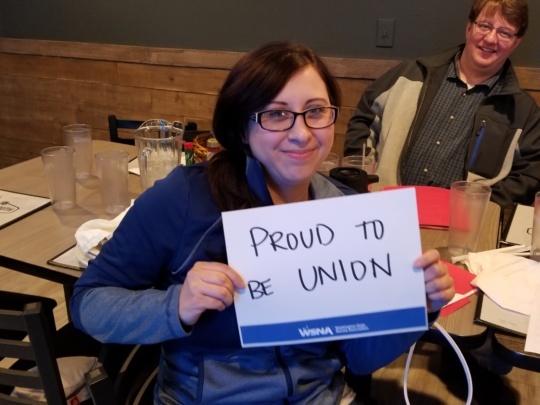 On Dec. 21, we are having a drop-in union social at the Red Elm Café from noon until 2 p.m. This is a family friendly event and everyone is welcome. It’s an opportunity to look at the contract, talk about workplace issues and concerns, meet nurses outside of your work area, make new friends and more! We hope to see you there. 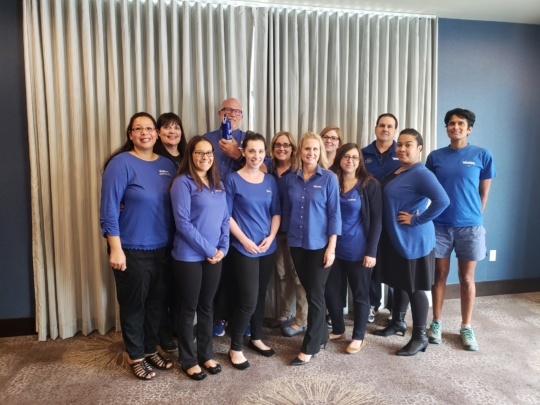 John Gustafson, Tiffany Repar, Rachael DeSouza, Dian Davis, Linda Burbank, Katherine Miller, Janet Stewart, Crystal Collins, Melissa Garcia and Francine Gumina. Questions? Contact WSNA Nurse Representative Pat McClure at pmcclure@wsna.org. We’ll cover your early bird registration fee of $400 so that you can attend this fun and educational event. Early bird registration ends Dec. 31, 2018 – if you’re interested in this great opportunity, reach out to us today. The scholarship also includes reimbursement for a 2-night stay, mileage and a $50 meal stipend. First consideration will be given to those who did not attend the 2017 Convention. Coupon codes will still work after Dec. 31 but will not cover the additional $50 fee for regular (not early bird) registration. Please contact WSNA Local Unit Treasurer Janet Stewart, RN atjstew4@msn.com or at 253-831-3923 to reserve your spot. With the University of Washington School of Nursing, WSNA is offering the opportunity to fulfill your 6-hour mandatory suicide prevention training requirement for licensure as part of your trip to Convention. This training is approved by the Washington Department of Health and is on their model list. Separate registration required. Lunch provided. 6 CNEs. We spent a majority of time in negotiations on Dec. 14 talking about the indecipherable pay stubs that you receive. Management claims they have no control over how those stubs read. The payroll system is across the CHI facilities. Supplemental Part-time and Per Diem requirements were discussed at length without reaching an agreement. We did a lot of talking about STAFFING and how to attract and retain nurses. Management’s point of view is that we now have a law that addresses staffing so we do not need language in the contract, but we need language in the contract that addresses staffing on all of the units. Our next meeting is Tuesday, Dec. 18. Please wear your blue pins and buttons as a show of support for the negotiating team. Dec. 21, we will be having an organizing meeting at the RED ELM from noon until 2 p.m. This is a family friendly event and everyone is welcome! We hope to see you there. Please welcome WSNA Nurse Representative Pat McClure, RN. Beginning Monday, Dec. 3, 2018, Pat will be taking over all issues as they arise at St. Joseph Medical Center. I will be assisting Pat with this transition in the coming months as needed. Pat can be reached at pmcclure@wsna.org 206-575-7979, ext. 3110. It has been a pleasure working with all of the St. Joe’s RNs over the past three years. I am continuing my work here at WSNA as a nurse representative with new assignments. I will miss the St. Joe’s nurses but know you will be in good hands with Pat. First and foremost, we want to give a great big thank you to everyone who has supported our negotiating team. For those who stepped up and took part in the sign making and picture taking, the signs were hung facing the management team during the session to make the greatest impact. Thank you to each and every one who wore WSNA pins as a show of support. They were certainly noticed by managers on the units. Please keep up the show of support for us, your negotiating team. A special thanks also go out to the 7th floor for all of the tasty snacks. It was greatly appreciated. During the session, management increased their wage proposal. We still have a ways to go, however. We are still working on the issue of floating between the Main OR and Walters. We encourage any nurse who has a story to tell about the effects of floating on safe patient care, patient satisfaction and job satisfaction to contact one of the negotiating team members to tell your story. Readable paystubs are still an issue. The practice of using PTO to cover your FTE, even if you pick up another shift, was also on the table. Our next negotiating session is Dec. 11 at 9 a.m. at the Holiday Inn and Suites. 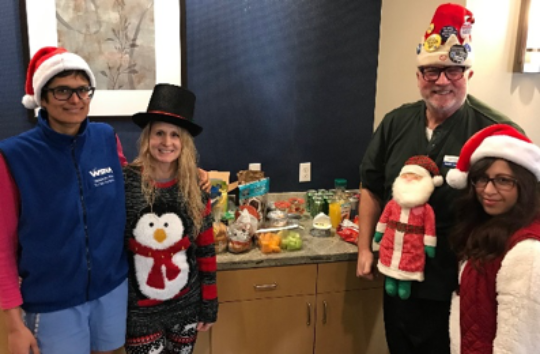 Remember, the Social Events are planned to take place on Wednesday, Dec. 5 from 5 to 7 p.m. at the 7 Seas and Friday, Dec. 21 from noon to 2 p.m. at the Red Elm. This is a family-friendly event and snacks are provided. Everyone is welcome! If you have any questions, contact WSNA Nurse Representative Pat McClure at pmcclure@wsna.org or at 360-904-8004. We, your bargaining team met with management on Nov. 19 for the sixth time. Throughout the morning and early afternoon, we discussed several issues which will have an impact on our wages, hours and working conditions. We were quite disappointed when the Medical Center ended the day early and failed to come back and address our latest proposal. 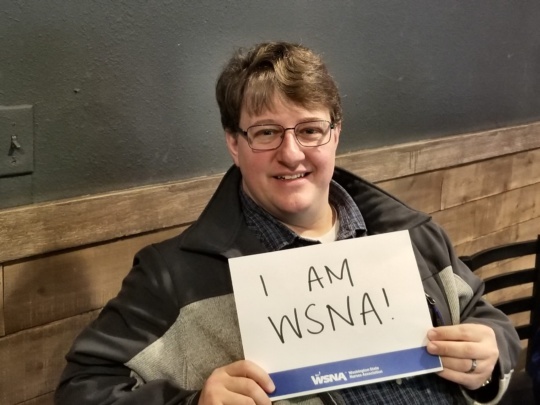 WSNA has made significant movement on a number of issues and the refusal to meet with the WSNA team in the afternoon was unacceptable and does not move us towards a resolution. What are some of the issues at stake? WSNA proposed to place per diems on the wage scale in order to enhance the recruitment and retention of good nurses. SJMC proposed to eliminate Supplemental Part Time nurses and to reduce pay in lieu of benefits from 15% to 10%. This change means Supplemental Part Time nurses will become per diems and will no longer accrue seniority and will not have the protection from the “just cause” provision (discipline). Per Diems would have a 5 shift/1 full weekend per month obligation and 2 holidays requirement. WSNA believes these changes are not in the best interest of the bargaining unit and is a takeaway. A two-tiered system is a valuable tool in recruiting nurses who desire more or less of a commitment and are available to work to cover vacations, leaves and other events. The hospital has been unable to adequately articulate why the current two-tiered system is not working. WSNA proposed to separate the main OR from Walters. This is a significant priority for members working in those areas who feel they are unable to remain competent due to logistics that prevent nurses from adequately cross-training and remaining competent. This creates an unacceptable safety risk. This has been an ongoing issue and it is more evident than ever that it is not sustainable. SJMC continues to reject this proposal. SJMC continues to push to reduce this benefit from 15% to 10% stating the new sick leave laws costs too much money. SJMC’s own data demonstrates that the cost is minimal. WSNA proposed language that enhances safe and adequate staffing in the hospital including language that provides staffing to cover vacations, etc. and staffing levels to ensure that charge nurses don’t have to take patient assignments. SJMC continues to propose that all staffing language is gutted from the contract. We had a great turn out at our contract negotiations update meetings last week. Thanks to everyone for your support of our team, great questions and eagerness to fight for our rights. Please continue to check our webpage for updates and opportunities to stay involved. 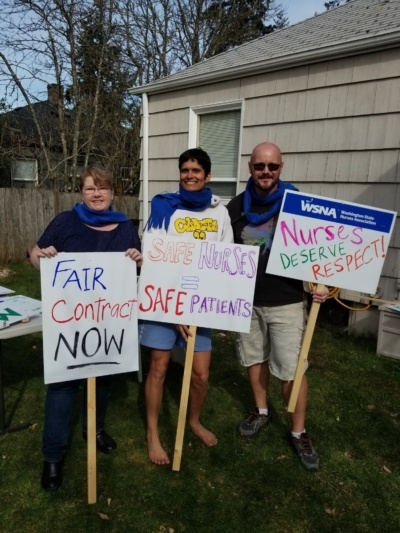 For ideas on how you can support the negotiations team on negotiation days, contact our WSNA Nurse Representative, Sara Frey, at sfrey@wsna.org or at (206) 575-7979, ext. 3039. We also had great turnouts at our October meetings to discuss SJMC’s proposed changes to the South Pavilion and 8 B/C and 9th. Again, thank you to everyone who gave input. Your participation guides our demands to management, so let’s keep talking – contact Sara Frey. There have been increased incidences of workplace violence at SJMC recently. Right now, we are fighting for our rights and safety as part of a DOSH investigation. Please contact Sara Frey now to share your experiences with workplace violence at SJMC. We all have problems scanning medications at times, because of unreadable barcodes, broken scanners, unavailable scanners, etc. Some coworkers are being disciplined for incorrect medication administration, when in fact the scanner problems are at fault. Please fill out the Medication Scanning Survey to help us quantify this problem and show SJMC that we need properly working equipment at all times. We always want to and need to hear from you about these issues, and any others. Please contact Sara Frey or any of our WSNA officers. Contact information is on our breakroom’s WSNA bulletin board. Please join us at the following events to visit with coworkers, get up to date on workplace issues, review our current contract and ask any questions you have. All events are casual and fun – and snacks are on us! Questions? Contact any of the negotiation team members, WSNA officers or WSNA Nurse Representative Sara Frey at sfrey@wsna.org or at (206) 575-7979, ext. 3039. Workplace violence incidents investigation is underway. WSNA and your officers are working hard on your behalf to ensure all measures are taken, in accordance with state regulations, to assure your safety in the workplace. The Industrial Hygienist Compliance Officer assigned to investigate the workplace violence incidents at SJMC has now initiated her investigation as a result of our complaint filed with the Division of Occupational Safety and Health (DOSH) at L&I for allegations of failing to ensure our safety in the workplace, failing to provide adequate training, and failing to evaluate workplace violence incidents in order to better protect nurses and other employees from harm. We are asking nurses who have experienced workplace violence to contact us with their experiences. If you are willing to share your experience, please provide your contact information so we can reach out to you. Nurses should not have to come to work with a fear that we will be assaulted during our shift. You may also share your experiences with us at the Nov. 7 local unit meeting and negotiations update. When: Nov. 7 from 1-2:30 p.m., 3:30-5 p.m. or 6-8:30 p.m.
Feel free to drop in at any time during any of these sessions. Team members, our WSNA Nurse Rep and chief negotiator will be on hand to answer your questions. Be involved! Be informed about what is going on and what is at stake in regards to our wages, hours and working conditions. We will also have refreshments available and there will be gift card raffles. Questions? Contact WSNA Nurse Representative Sara Frey at sfrey@wsna.org or at 206-575-7979, ext. 3039. 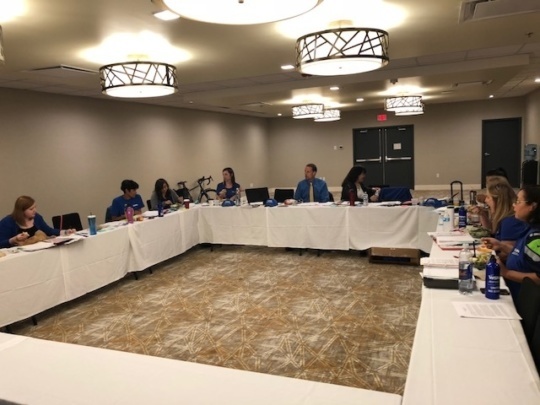 We would like to give a big shout out and thank you to the ACC for providing our negotiating team with great snacks and beverages for our fifth negotiation session on Oct. 30, 2018. If your unit would like to provide some snacks or lunch at an upcoming session, please contact one of your local unit officers or a member of the negotiation team. Workplace violence incidents are being investigated. We now have an Industrial Hygienist Compliance Officer assigned to investigate the workplace violence incidents at SJMC as a result of our complaint filed with the Division of Occupational Safety and Health (DOSH) at L&I for allegations of failing to ensure our safety in the workplace, failing to provide adequate training and failing to evaluate workplace violence incidents in order to better protect nurses and other employees from harm. Nurses should not have to come to work with a fear that we will be assaulted during our shift. At our most recent negotiation session, we also presented a proposal to management related to workplace violence. We need your help. Have you experienced workplace violence at SJMC? We need to hear from you. Let us know if you are willing to speak with the investigator from DOSH. Staffing remains a priority. We continue to fight to retain and improve staffing language in our contract and we also exchanged a “package” of proposals which the hospital is now considering. Want more details on specific WSNA proposals and management takeaways? Come to one of the negotiation update meetings. Questions? Contact WSNA Nurse Representative Sara Frey at sfrey@wsna.org. Nurses at SJMC shouldn’t be afraid for our lives when we go to work, yet several nurses were seriously assaulted by the very patients for whom they were caring. WSNA and your officers are aware of a recent string of violent incidents involving a patient on an involuntary hold at the hospital. These incidents have resulted in a number of nurses receiving significant injuries. SJMC has an obligation to implement all necessary measures to prevent and protect nurses and other employees from violence and threats of violence in the workplace. We have taken immediate and swift action. A demand for action letter was sent to SJMC’s CEO insisting they respond to this serious threat to nurses and staff. Find the letter here. Demand for information requested. An information request has been submitted to determine what further steps need to be taken to ensure the hospital is in compliance with the law and your collective bargaining agreement. L&I complaint filed. We have filed a complaint with the Division of Occupational Safety and Health (DOSH) at L&I for failing to ensure your safety in the workplace, failing to provide adequate training and failing to evaluate workplace violence incidents in order to better protect nurses and other employees from harm. We should not have to go to work with the fear that we will be the victim of a violent attack. We have every right to expect our employer to take all precautions, as required by law, to prevent such attacks. If you have questions or believe you are being placed in a specific, dangerous situation, please contact one of us, your local unit officers, WSNA Nurse Representative Sara Frey. Have you had problems with thinking you successfully scanned a medication only to find later the medication has failed to appear in the patient’s EPIC medical record? WSNA has reason to believe there are ongoing issues with medication scanning and administration which is resulting in nurses being disciplined and the filing of multiple grievances. We need to hear about your experiences. Please take this survey to assist us. We, your negotiation team, met with management on Oct. 9, 2018 for our fourth negotiation session. During previous sessions, we made proposals of basic staffing standards including adequate staffing to allow nurses to utilize their PTO. SJMC management responded by attempting to strip the contract of all staffing language in section 6.11 and 6.12. At this most recent session, management renewed their proposal to eliminate the safe staffing language from the contract, including language that protects the nurses from retaliation for raising staffing concerns. The Medical Center is also continuing to try to condense clinical groupings and float individuals more broadly. This includes attempting to fold ACC into Med Surg. SJMC is also not willing at this time to separate Walters from the main OR despite both management and nurses raising concerns. We have significant concerns about the ability to maintain competency of the nurses who are floated and the safety of the patients and have a proposal related to floating. 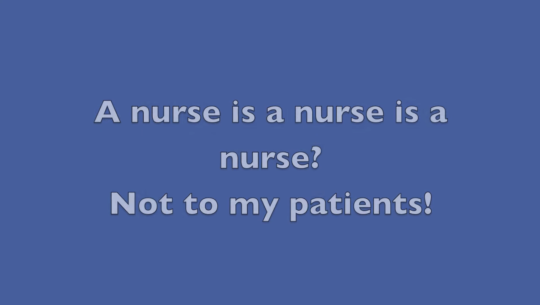 Recently, some of our team members played roles in this video depicting why floating of nurses anywhere is not always the right thing to do. The Medical Center gave us their economic proposal and we are far apart on wages. We are working hard to assure the Medical Center is able to retain and attract nurses to care for our patients. What’s next? Come talk to us, your negotiation team, and get the latest on negotiations. 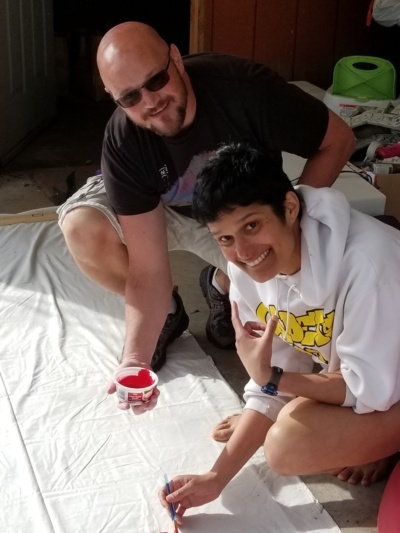 Drop in, get the scoop, be involved, know what’s going on! Time: 1-2:30 p.m., 3:30-5 p.m., 6-8:30 p.m. Spend some time with your peers and membership officer, Rachael DeSouza (please note the Happy Hour that was scheduled on 11/7 is canceled due to the above negotiation meetings). When: Wednesday, Dec. 5 from 5-7 p.m. Your WSNA bargaining unit team of registered nurses met on Thursday, Aug. 30 for our second bargaining session. Our team forcefully advocated for improving staffing and a paycheck system that is clear and transparent. Both sides exchange proposals and had dialogue around some non-economic issues. We were able to reach tentative agreements on smaller issues. Our next scheduled bargaining session is set for Sept. 26. 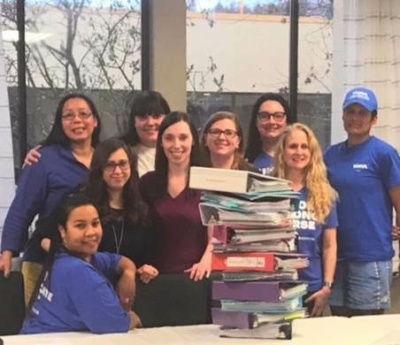 Your bargaining team of St. Joe’s nurses continues to volunteer countless hours to this process and to fight for the nurses who make St. Joe’s work. Your priorities are the driving force behind our proposals as identified through personal conversations and our pre-negotiation surveys. All events are designed to allow you to drop in at your convenience and find out more about what’s going on. Your bargaining team met with your employer this week for our first negotiation session. We presented proposals which include language promoting safe and effective staffing, and a wage increase which is competitive and encourages recruitment and retention. Our next bargaining session is on Aug. 30. 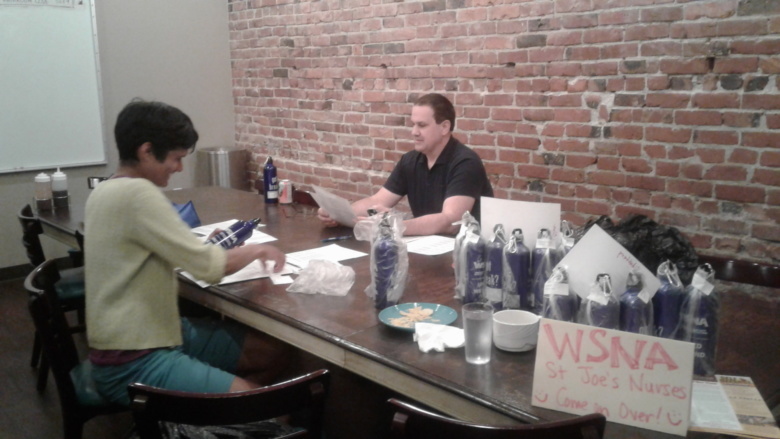 It’s time to bust out your WSNA swag – WSNA water bottles, buttons, badge pulls, etc. We are seeking additional unit reps to assist with support of the negotiation team. If your unit would like to bring snacks or would like to find out about other ways to support your negotiation team, please contact one of the officers. Email updates and your WSNA local unit webpage is the quickest way to get up-to-date information. If we don’t have your current email address, please contact Nurse Rep Sara Frey at sfrey@wsna.org. The next happy hour date is Wed., Sept. 5. Please join your coworkers for happy hour! We do it every month after New Hire Orientation. We’ll provide snacks and have a copy of our current contract. We can talk about workplace concerns, contract questions and/or simply hang out and have fun together! When: Tues., Sept. 18 from 12:30 to 2:30 p.m. Happy Hour isn’t your thing? Join us for lunch and conversation. Come to lunch at Red Elm (five blocks from the hospital on MLK). Again, we’ll provide food, and can talk about workplace issues or simply relax together. Some of us attended conferences this month and wrote about our experiences. Check out the awesome things SJMC are up to! If you also would like to attend a convention, let us know! Rooming with Liz Leske, the co-chair of TG’s WSNA unit, and planning future local events that SJMC and TG can do together. Informational picketing at Central Washington Hospital (a WSNA facility). The technical workers, UFCW members, are in difficult contract negotiations. After the picket, management agreed to return to the bargaining table with a mediator! Feeling the sense of trust, family and fun shared by labor union members. Listening to Elise Bryant, president of the Coalition of Labor Union Women, speak about the labor movement and sing traditional labor songs. The Pierce County chapter of the Washington State Labor Council meets monthly in Tacoma. If you want to learn more about local labor issues, consider coming to a PCCLC meeting. I’ll be there! Write to me for more information. I was a delegate to the American Federation of Teachers (AFT) Conference in Pittsburg PA. AFT has 1.7 million members and all WSNA members are AFT members, too. Edna Cortez, Chair of Seattle Children’s local unit, and I stood up in support of a resolution on Promoting Prevention of Workplace Violence. 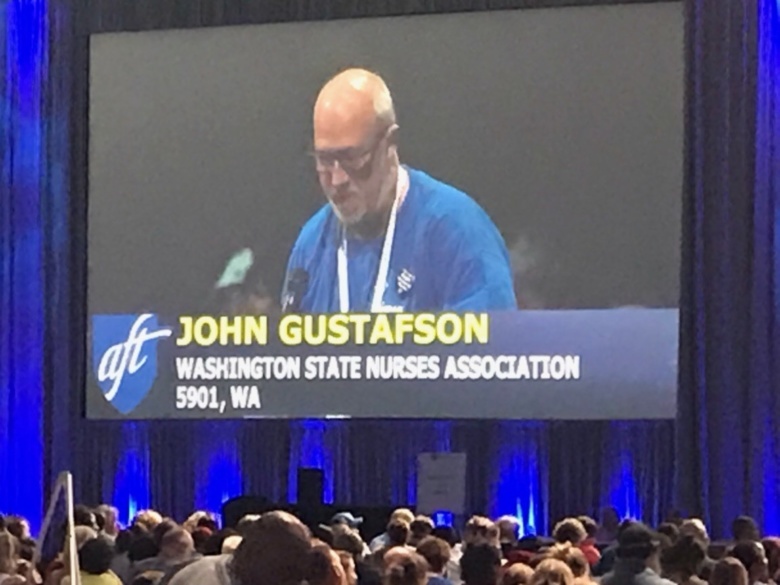 During the 4 day conference there were speeches, presentations and much support given to nurses at the conference by Hillary Clinton, Bernie Sanders, Elizabeth Warren, Governors and Mayors and other legislators. I encourage all WSNA AFT members to get involved. We Care, We Fight, We Show up and We Vote. Please register and vote in the next election. Would you like to be more involved? Have ideas for an event? Want to see something change? Please let me know! We can make it happen together. For any questions, please contact WSNA Nurse Representative Sara Frey at sfrey@wsna.org. Our contract negotiation team has met for the first time! Thank you so much for filling out the survey about your concerns. Those results really drove the conversation and gave us great information about what matters to you. We look forward to representing all of you when we meet with management (date to be determined) to discuss our contract. Your ongoing support and enthusiasm is so important to our success as a bargaining unit! 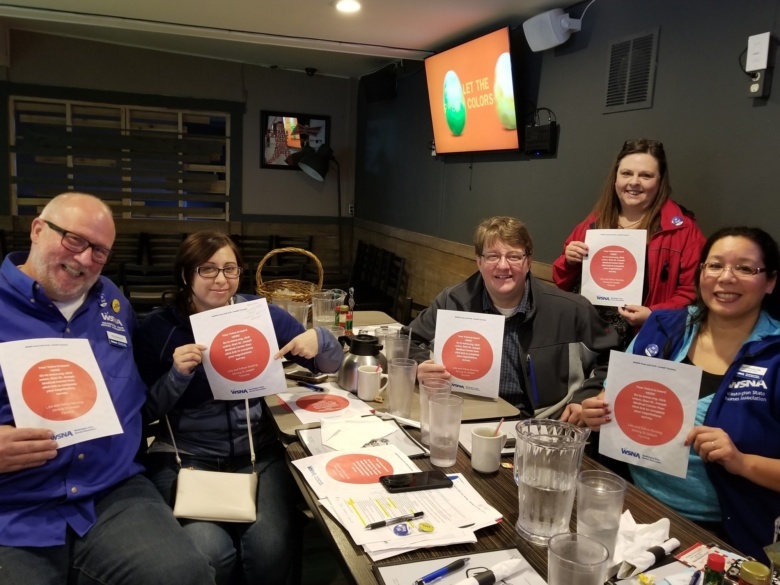 Back in March, unit reps met and planned our Nurses Week gifts. We chose aluminum water bottles, printed at a union shop in the USA, that say “Got Break?” to celebrate our break relief settlement! We passed out many of the bottles during Nurses Week in May, and finished up distributing bottles this month. Thank you to the fun, dedicated reps who helped label, bag and pass out bottles over the last two weeks. We hope that you enjoy sipping from them on your well-deserved uninterrupted rest and meal breaks. Monthly happy hour, just for us! Many of us want more opportunities for casual gathering and conversation among our fellow nurses. 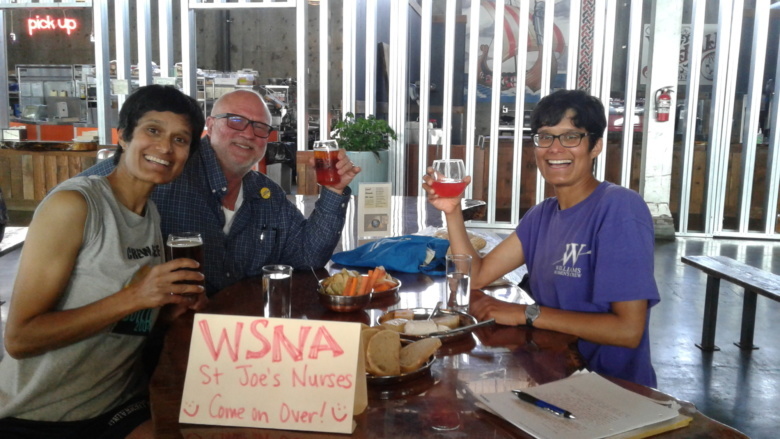 So, we are initiating monthly SJMC WSNA Happy Hour, hosted by your membership team! Join us at the 7 Seas in Tacoma (down the hill from SJMC on Jefferson and 21st), from 5-7 p.m. every first Wednesday of the month. WSNA will provide delicious munchies and a gift card raffle, and drinks are available for individual purchase. June 6 was our first Happy Hour, and we had a great time. Looking forward to seeing you there! Due to the holiday, we will meet on July 5 at the 7 Seas, instead of July 4. Do not miss out! Let’s power up for a great 2018 negotiations! Do you have questions? Have an idea? Want to get involved? St. Joseph officers and activists prepping for the 2018 negotiations! 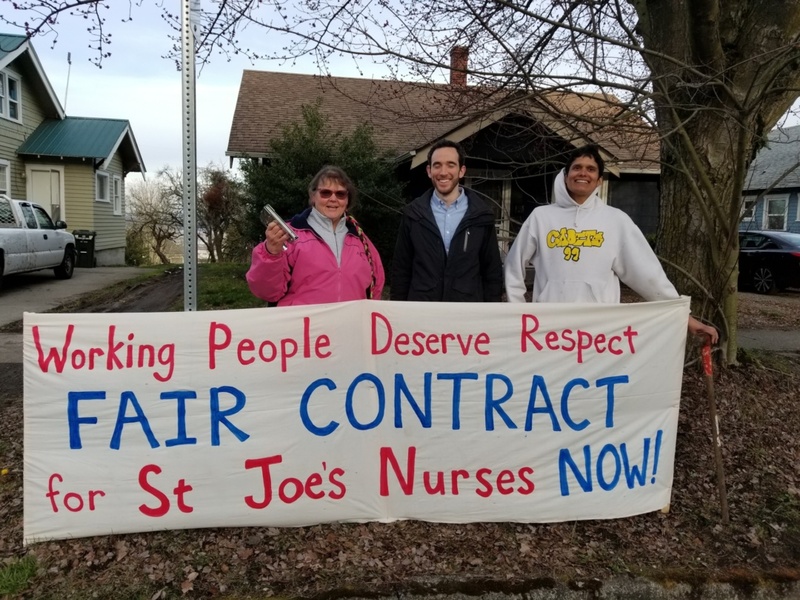 Join and help their efforts by completing the bargaining survey if you haven't already, and follow and like on Nursing Strong St Joe's Tacoma Facebook page. Like our St. Joe's nurses Facebook page! Your WSNA officers are sponsoring attendance to the Pierce County Nurses Association annual banquet. If you would like to attend, please email Janet Stewart at jswsna@gmail.com to be added to the list. Please RSVP with Janet no later than Friday, May 4, 2018. You are welcome to bring a spouse, friend, etc., however, your guests must register and pay separately. Negotiations are coming up this fall! This is your contract and we need your input. Please assist us with identifying your needs for the upcoming fall 2018 negotiations. This is vital information that your negotiating team needs in order to best represent your needs. Complete the negotiation survey now! Your local unit officer are also seeking volunteers for various activities surrounding negotiations including being part of the negotiation team. This is your contract and your opinion matters! Please let your officers and negotiation team know what your priorities are. Even if you are not on the team, you play an important roll in securing a fair contract. Questions? Contact one of your local unit officers. Or your nurse representative, Sara Frey at sfrey@wsna.org or (206) 575-7979, ext. 3039.